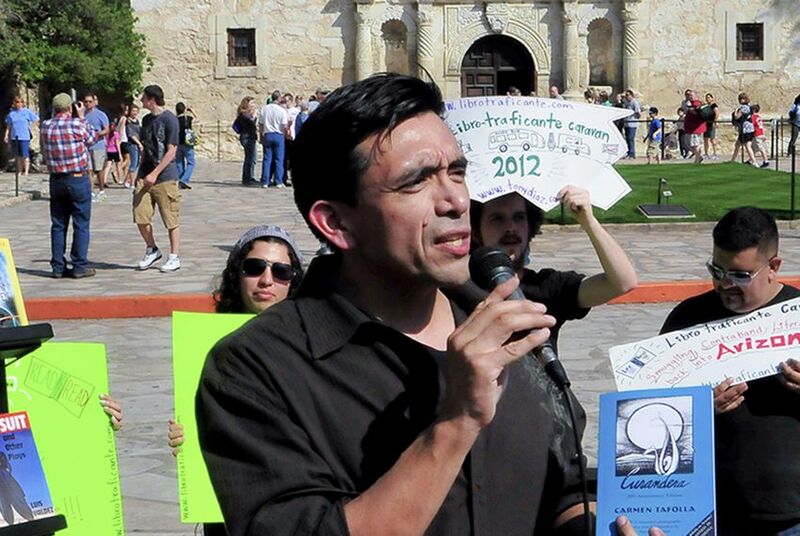 Nearly a year after the Texas State Board of Education rejected a Mexican-American studies textbook proposal opponents called racist, an advocate involved in that fight is now working to get his own book approved by the state. Protesting a 2010 Arizona law prohibiting ethnic studies in the classroom, advocate and professor Tony Diaz once led a caravan of cars through Arizona that "smuggled" books removed from school shelves into "underground libraries" across the state. Now he's following the letter of the law to get Texas to approve his proposal for the first state-adopted Mexican-American studies textbook, which would be used next school year. "It takes a major publisher with grassroots and major knowledge on the local level to get this through," he said. "We have gone from being librotraficantes [book smugglers], to now we're going to be the publishers." The Texas State Board of Education is hearing public testimony Wednesday on Diaz's book "The Mexican American Studies Toolkit," one of two ethnic studies textbook proposals submitted in response to the board's request last November. Last year, the board rejected a different proposal for a Mexican-American studies textbook after advocates and academics vehemently decried it as error-ridden and racist, putting Texas in the national spotlight yet again for textbook-related controversy. The board will also hear public testimony on a Jewish studies book Wednesday. The publishers have several opportunities to respond to any critiques or fix any errors, before the board votes on both books this November. A preliminary deadline for Texas Education Agency staff to provide board members with reports about the books was pushed to next week, because of Hurricane Harvey. Because of a new law the state Legislature passed in June, board members can vote to reject a book if they don't believe it is "suitable" for a specific subject or grade level. The law does not specifically define what criteria members can use to determine a book unsuitable. The liberal watchdog Texas Freedom Network warns that board members could use the law to "censor" materials based on personal or political beliefs. Board chairwoman Donna Bahorich, R-Houston, said the law allows the body to reject textbook submissions that are error-free but poorly written or developmentally inappropriate. "We could [reject them] but we'd be risking possible suit" before this law came into effect, she said. If the publishers fail to persuade board members to approve these textbooks in November, advocates will have to see if the board decides to issue another call or drops the matter altogether. In the meantime, school districts wanting ethnic studies courses will need to do more work to find their own textbooks and develop their own curricula to meet state standards. National support for teaching ethnic studies to high school students swelled after 2010 when Arizona state legislators banned public school classes that "promote the overthrow of the United States government," "promote resentment toward a race or class of people" and are "designed primarily for pupils of a particular ethnic group." A federal judge ruled the law violated students' constitutional rights, but has not yet issued a final judgment. In 2015, the Texas State Board of Education voted to put ethnic studies, including Mexican-American, African-American, Asian-American and Native American studies, on a list of social studies textbooks it would ask publishers to develop for Texas schools, giving schools a list of state-approved resources if they chose to offer ethnic studies courses. The only publisher to respond to the call for proposals in 2016 was Cynthia Dunbar, CEO of Momentum Instruction Inc. and a former state board member, with a textbook called "Mexican American Heritage." A committee of professors and high school teachers found more than 140 errors in the book. In one of the most controversial passages, removed in a later draft, the textbook's authors wrote, "Stereotypically, Mexicans were viewed as lazy compared to European and American workers." Dunbar argued that her critics were not accurately representing the book's content, and she threatened to sue the Board of Education for rejecting it. The same week the board voted to reject Dunbar's proposal last November, it unanimously voted to accept more bids for ethnic studies textbooks for 2018. Renewing the call for textbooks was an unusual move for the state, though it has happened a few times before, said Debbie Ratcliffe, State Board of Education spokeswoman. Diaz, working with Iowa-based publishing company Kendall Hunt, was the only person to submit a Mexican-American studies textbook proposal this time around. "Some of the scholars who were helping refute [Dunbar's] textbook were trying to get a book together, but it was too short a time frame," said Diaz, director of intercultural initiatives at Lone Star College-North Harris. The 261-page "Mexican American Studies Toolkit" is intended to "dispel the illusion that Mexican American history and culture is foreign," according to its introduction. It is not a linear historical account, but rather a compilation of chapters on aspects of Mexican-American culture and politics, including first-person essays and narratives from prominent Hispanic scholars and advocates, several by Diaz himself. In one first-person selection, Diaz profiles a Mexican-American civil rights activist, starting: "We register on the American Imagination in three phases. First, we are invisible. Then, we are vilified. Then, we are accepted, but only as a consumer group. We are never imagined as Intellectuals. This step is key to fully entering the American Imagination." He ends the selection: "We will not allow Texas to become the next Arizona. We will defend our history from the classroom to the courtroom." Diaz says his textbook, unlike Dunbar's, includes input and guidance from Mexican-American studies experts and educators. "I feel it's going to be different than most textbooks," he said. During his time protesting Arizona's ban on ethnic studies, starting in 2012, he built a national network of scholars he could call on for help. Despite the short time frame he had to work on the book, he said he managed to consult teams of professors, high school teachers and conservative activists, to get feedback. He said he is open to hearing concerns from the board and public Wednesday. "How can we put it in a light that is fair, is accurate, and at the same time shows students how this material is relevant?" he said. Three people are signed up to testify on Diaz's textbook Wednesday, including Diaz. Board member Barbara Cargill, R-The Woodlands, said she does not anticipate a controversial hearing, based on a scan through the book and the fact that constituents are not reaching out in fury. She said she will look through the book to "make sure there's nothing demeaning or nothing radically said," unlike Dunbar's textbook, which "used a lot about stereotypes." Though all board members voted against the controversial textbook last November, some protested during an initial debate in 2014 on whether Texas should allow or require schools to offer Mexican-American studies. Supporters of a required class argued that adding a Mexican-American studies class was necessary because the majority of students in public schools are Hispanic; opponents argued the class was divisive. "We're not about Hispanic history; we're about American history," board member Patricia Hardy, R-Fort Worth, said at the time about a required course. "We're not taking each little group and saying, 'You're the majority, so we're going to teach your history.' We're Americans, United States people." On Tuesday, Hardy said it was better to allow passionate teachers to choose their own materials for an optional ethnic studies class than to have the board fight to try to adopt a Mexican-American studies textbook. "It would keep this controversy down," she said. "It causes tension and a negativity I don't think is necessary." She has not yet read Diaz's book, but she is "worried a little about someone putting in a political bias." Board member Ruben Cortez Jr., D-Brownsville, said Monday he had not yet finished reading Diaz's entire textbook but he doesn't see anything "offensive" or "racially charged" in it. "History is what it is. If a member of the board finds that offensive, I really can't change that," said Cortez, who has argued that Texas students should have to take a Mexican-American studies course to graduate, instead of just using it as an optional elective. "I'd be interested to know where some of the board members are going to take issue with some of the passages."